On a beastly hot late summer day, there's nothing better for kids than ice and snow. We've had a whole Arctic in August theme going the last two days, full of great frosty activities that appeal to the little artist, scientist, and construction engineer in every preschooler. Some advance prep was required, but nothing too time-consuming. 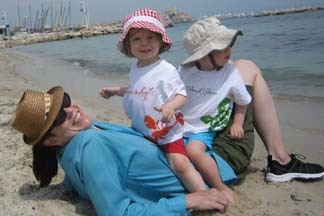 The sensory joys of these activities are their own reward. I've been feeling fairly homeschooly lately, so I prefaced some of these activities with a little lesson about the North Pole: where it is, why it's called a "pole," what conditions there are like, what animals live there. I'm sure there are good books out there that cover this material, but I just sat with my kids by my side and used Google Image Search to find some relevant photographs: a spinning globe, some icy Arctic landscapes, and sundry Arctic creatures. My children suggested that if we were going to the North Pole, we needed to take the Polar Express, so before we even made it to the back yard, we got to assemble a long train with kitchen chairs and undergo an exciting and perilous journey. First on our agenda was ice painting, an ideal hot-weather preschool pursuit. Freeze slightly watered-down tempera paints in an ice cube tray, balancing craft sticks in each space to serve as handles once frozen. (Don't worry, the handles don't need to stick straight up.) 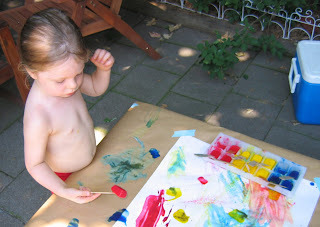 Give your kids some big sheets of paper to paint on, and turn them loose. The paints spread quite nicely once the melting really begins. As another ice experiment, I froze diecast cars and plastic bugs inside big blocks of ice. (I used empty milk cartons: fill with about an inch of water, freeze, add toy plus more water, freeze, and repeat.) To get the toys back out, you can just let the summer sun do the work, or better yet, help your kids experiment with different ways of melting the ice. Mine especially enjoyed playing with warm water, a garden hose, and a big shaker of salt, and were excited about the different effects each method had on the ice block. 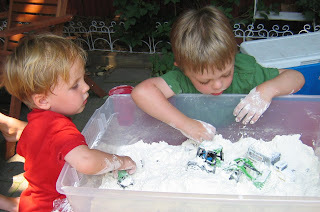 Later, once the children's hands were dry, I dumped five pounds of white flour into a big bin and let them play snow mountain with it, using little loaders and dump trucks to move the snow about. They clearly loved the soft, cool feeling of the flour and had a grand, messy time. A garden hose took care of the considerable spillage. By the time all these activities were over, we had talked about everything from geography to chemistry to color theory. And we topped it all off, of course, with an icy treat: homemade juice popsicles. I'm a friend from the Hunting Club, Happy Camp History Club. I'm using your suggestions for my 1 year old girl and 3 year old boy! You are great. This sounds like so much fun! I'm going to do some of these things with my girls. I also make "rainbow ice cubes" (add food coloring before freezing ice cubes) to play with in the bathtub. They love it! Is there a trick to the rainbow ice cubes? The one time I tried making ice with water to which I added food coloring, the dye all concentrated at the bottom of the ice cube tray. Did I just not stir correctly? I am the Editor of a family magazine (set to launch this November) and I would love to speak with you about the possibility of contributing to the publication. I did notice that you were taking a break from journalism, and if you are not looking to write any new material at this point in time, I would even be interested in publishing some of your previous posts. If you would be at all interested, you can contact me at christinerosemangan@yahoo.com. I hope to hear from you soon! I adore your ideas. They are truly inspiring. I can't wait to try some with Izzy. Nice running into you at Battery Park today.